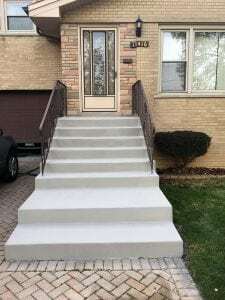 Our experienced Concrete Contractors are able to provide a Concrete Resurfacing service in Chicago and its suburbs. With many years in the concrete industry, our company is able to deliver fast and effective results at competitive prices. Whilst Concrete is an incredibly durable material and will last many years under normal use, it will eventually wear down slightly and look a bit ‘worse for wear’. Don’t worry though, you don’t need to completely replace the concrete. In fact, this is not recommended at all. One of the best things you can do is find a company, such as ours, which provides concrete resurfacing. Our team is able to put a thin layer of concrete over the top of your surface. This will make it look as good as the day that it was first installed. You really will be surprised at just how much of a difference concrete resurfacing in Chicago can make to the look. If you wish to find out more about our Concrete Resurfacing service then please do not hesitate to get in touch with our customer service team. They will provide you with all the information that you require, as well as assist you in the process of obtaining a quote.